Introduction: The effectiveness of esophagomyotomy for improving swallowing in elderly patients with achalasia compared with younger ones has been questioned. This study was designed to provide an answer. 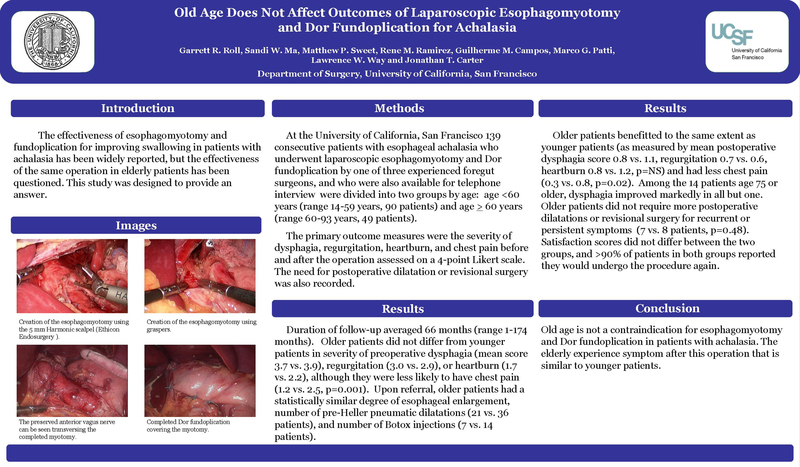 Methods: 139 consecutive patients with esophageal achalasia who underwent laparoscopic esophagomyotomy and Dor fundoplication and who were available for telephone interview were divided into two groups by age: age 60 years (range 60-93 years, 49 patients). The primary outcome measures were the severity of dysphagia, regurgitation, heartburn, and chest pain before and after the operation as assessed on a 4-point Likert scale. The need for postoperative dilatation or revisional surgery was also recorded. Results: Duration of follow-up averaged 66 months (range 1-174 months). Older patients did not differ from younger patients in severity of preoperative dysphagia (mean score 3.7 vs. 3.9), regurgitation (3.0 vs. 2.9), or heartburn (1.7 vs. 2.2), although they were less likely to have chest pain (1.2 vs. 2.5, p=0.001). Upon referral, older patients had a statistically similar degree of esophageal enlargement, number of pre-Heller pneumatic dilatations (21 vs. 36 patients), and number of Botox injections (7 vs. 14 patients). Older patients benefitted to the same extent as younger patients (mean postoperative dysphagia score 0.8 vs. 1.1, regurgitation 0.7 vs. 0.6, heartburn 0.8 vs. 1.2, p=NS) and had less chest pain (0.3 vs. 0.8, p=0.02). Among the 14 patients age 75 or older, dysphagia improved markedly in all but one. Older patients did not require more postoperative dilatations or revisional surgery for recurrent or persistent symptoms (7 vs. 8 patients, p=0.48). Satisfaction scores did not differ between the two groups, and >90% of patients in both groups reported they would undergo the procedure again. Conclusions: Old age is not a contraindication for esophagomyotomy and Dor fundoplication in patients with achalasia. The elderly benefit just as much as younger patients.